In today's Portland Press Herald, I wrote about a Canadian research team's discovery that record-warm Gulf Stream water is pouring into the Gulf of Maine, probably because of a weakening of the normally dominant, very frigid Labrador Current flowing down from Greenland via Atlantic Canada. The water - at depths of more than 200 feet - was a balmy 57F earlier this month, 11 degrees above the norm for this time of year, and other scientists say such water has been filling deepwater basins inside the Gulf for months. Exactly what will happen next is uncertain, but the fear is that when the water upwells to the surface -- usually during winter - it could contribute to another "ocean heat wave" like the one in 2012 the wrecked havoc with just about everything in the Gulf and set off a chain of events that had New Brunswick lobstermen detaining trucks filled with Maine lobster at the gates of Canadian processing plants. For more on the warming of the Gulf of Maine and the possible consequences, consider my 2015 Press Herald series "Mayday." I last wrote on the situation -- and Maine's lack of response -- in November. 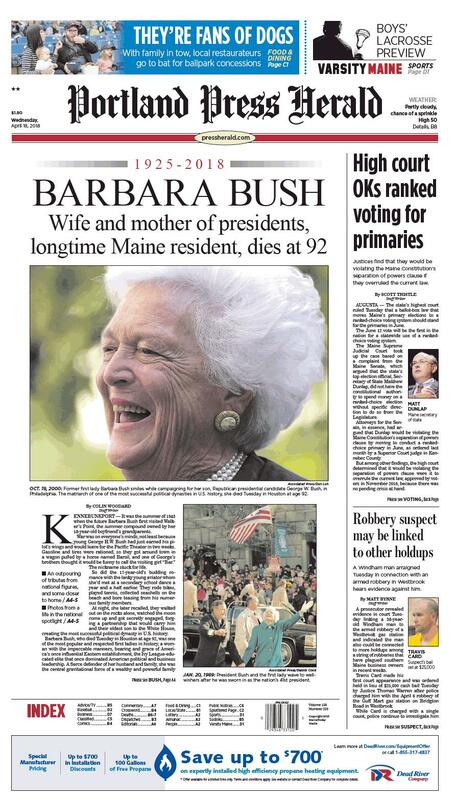 Former First Lady Barbara Bush died last night at 92. I had the privilege of having written her obituary for her summertime local paper, the Portland Press Herald, which you will find in today's print edition. 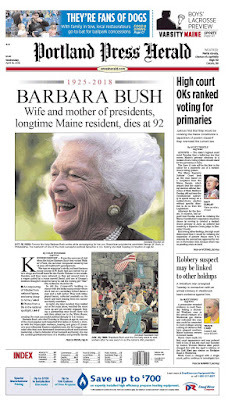 The Bushes identified themselves with Texas for political reasons, but through their lives Walker's Point in Kennebunkport has been the only constant. They got engaged there, held weddings, family events, and high-level diplomatic events, and spent nearly every summer at the compound. It was their only home in the U.S. during the years they lived in Beijing and at the US Naval Observatory and White House. During World War II they also lived briefly in Lewiston-Auburn, while he was training at the naval air station there. The Press Herald also has a photo gallery of her life up at the website. I ran across this one accidentally on Twitter. Last week, U.S. 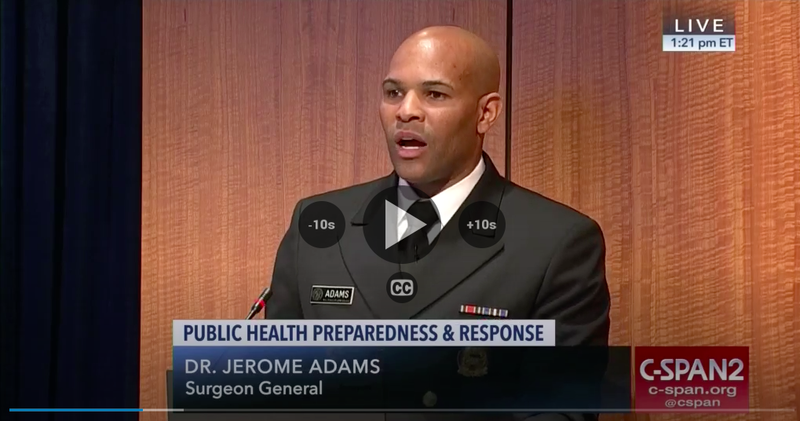 Surgeon General Jerome Adams gave the keynote address at the American Public Health Association's National Public Health Week Forum in Washington, DC. 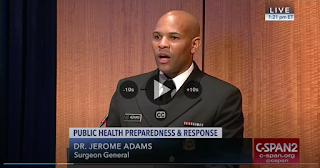 Turns out Dr. Adams is an American Nations fan, and he spent several minutes talking about the importance of the paradigm in understanding regional differences in public health challenges and outcomes. "When you look at what's done, when you look at asset health care coverage, when you look at immigrant rights, at contraception and abortion, when you look at drug policy and reduction, two places, Paris, France and Berlin, Germany, that tried to blow each other off the face of the planet, are closer together than Dallas, Texas and Boston, Massachusetts," Adams said. "We truly are a country of different nations." Here's a clip of his remarks culled from C-SPAN-2's coverage of the event. How did ranked choice voting become a polarized, partisan issue in Maine? In June, Maine is expected to hold the first-in-the-nation statewide primary election using ranked choice voting, with contests for governor, US Senate, and Congress on the agenda. But it is shaping up to be a potential disaster, as partisan differences have placed state election officials in the impossible position of being under a legal obligation to hold an election while not being given the means -- financial, administrative and possibly constitutional -- to do so. If nothing changes, there could be long delays in getting results, and the gubernatorial races in particular could be mired in law suits. In this week's Maine Sunday Telegram, I asked how a theoretically neutral electoral reform intended to reduce partisanship and polarization has become mired in polarization and partisanship, with Maine voters and legislators sharply split on party lines. The answers may surprise. I last wrote about ranked choice voting in Maine just a week before, in this magazine piece for Politico. 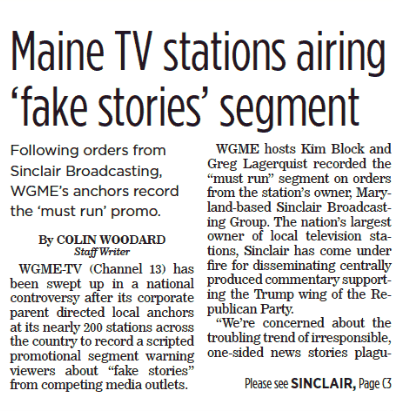 Over the weekend, a montage went viral that featured dozens of local television anchors at Sinclair Broadcasting stations across the country reciting the same promo about their concern over "fake stories" being carried by other (unnamed) media outlets. The anchors expressed their concern about "the troubling trend of irresponsible, one-sided news stories plaguing out country" and denounced "some media outlets" for publishing "these same fake stories...without checking their facts first" and for using "their platforms to push their own personal bias and agenda to control exactly what people think." Critics noted that the Sinclair stations themselves have a troubling reputation for running one-sided, pro-Trump opinion segments and nightly "Terrorism Alert Desk" updates produced at their Maryland headquarters and distributed on a "must run" basis to all of their nearly 200 local stations' newscasts. They're also currently seeking Trump administration approval to buy dozens more stations nationwide. More details in the story. 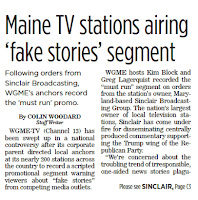 I last wrote on Sinclair and WGME last summer, when the chain was under fire for "must run" segments featuring a former Trump aide.